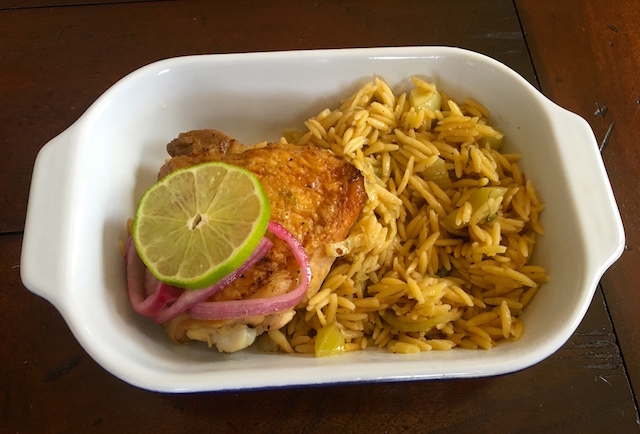 Chicken & Orzo – So Simple! This spring, I have been obsessed with both my pressure cookers (I own two) and my cast iron skillet. I have come to realize that I truly could live forever with just these pots and pans and be able to make delicious food with little fuss or bother. I have also been a recent convert to chicken thighs. I used to love white meat, bone-in chicken or turkey breast meat, yet recently I have settled on dark meat for it’s higher fat content (read flavor) – plus it gives me a little more wiggle room while cooking. I just find it tastier and more adaptable to the dishes I like to make. Enter this recipe I spotted for a “one pot chicken thighs with orzo” dish on Epicurious. I had chicken thighs with bone in and skin on in the freezer AND I had both a fennel bulb and a large leek from the farmers market so it seemed to be calling my name. I did not have white wine or the usual vermouth that I keep in the fridge for times like this, but I did have rum. Why not? It’s a little sweet but I didn’t feel like making a special trip to the grocery store. Press salt and pepper onto the skin side of the chicken thighs. Heat 1 Tbsp butter (or olive oil if you prefer in a preheated (medium-high) cast iron skillet. Nestle chicken, skin side down, in skillet in a single layer with no gaps. Cook until the meat is opaque around the edges and skin is deep golden brown, 6–8 minutes. Turn chicken skin side up and transfer the cast iron skillet to the preheated oven; bake, uncovered, until chicken is cooked through, (~15 minutes). Transfer chicken to a plate. Set the same skillet over medium heat; combine chopped fennel bulb and sliced leek in skillet and sprinkle in some salt and pepper. Cook, tossing occasionally until the leek is looking golden around the edges, about 5 minutes. Be careful of the very hot panhandle! Add orzo and cook until pasta is darkened (it will take on a brown hue) to a nice nutty brown in spots and toasty smelling, about 3 minutes. Pour in wine (or rum!) and cook, stirring, until liquid is evaporated, about 1 minute. Add broth ½ cup at a time, stirring constantly and letting broth absorb before adding more until orzo is tender and broth is mostly absorbed but the pan is not dry, 10–15 minutes. You might not need all the broth. Remove skillet from heat, taste and add more salt and pepper to your liking; mix in lemon juice and remaining 1 Tbsp. butter, then chopped fennel fronds. Pile chicken on top and finish with lemon zest. I pick something colorful to garnish this dish since it is pretty brown! This entry was posted in Poultry and tagged Cast Iron Chicken Orzo. Bookmark the permalink.